A little while ago, I added a couple of new “firsts” to my lists. One was buying something from Etsy and the other was finally buying something from Adafruit. 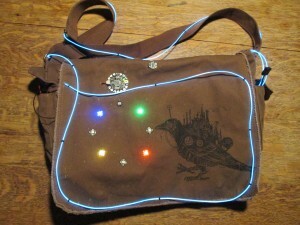 I bought a messenger bag from CrawlSpace Studios through Etsy and I decided that having just a bag would be a bit boring, so why not add some electronics to it?